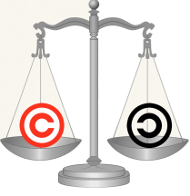 Jorgen’s Weblog: Copyright is good. Copyright is bad. Some thoughts. Copyright is good. Copyright is bad. Some thoughts. Copyright is good. Copyright is bad. Patents are good. Patents are bad. All of these are true, and we live in difficult times. The recent protests about SOPA, PIPA, ACTA and other cute acronyms have pointed towards a major problem of our times: Our copyright and patent laws do not “feel fair” anymore. It’s an important aspect of laws that they do feel fair in general, although maybe not necessarily in specific applications involving ourselves. Technological advances, from movable types to digital storage, have made copying of other people’s work and ideas more and more easy. Copyright law is an attempt to make this fair for everyone. It should be obvious that it needs to adapt to technological advances. Imagine an aspiring writer who spends hours each day, every day, for half a year, to write a novel. It’s an excellent work and the readers will love it. She sends the manuscript to a publisher. The publisher likes it, publishes it, maybe even under a different name, and keeps all the money for himself. Is this fair? Certainly not. This is the prototypical case for which copyright law was invented. The idea is that a person should have a right to be rewarded for their creative work, regardless of how easy it is to copy. Our copyright laws do achieve this, and that is why they are good. But sadly, they also achieve much more. A teenager who finds an awesome song by a new artist and gives a copy of it to his friend does not particularly strike us as a criminal. But that’s what the basic idea of our current copyright laws make that person. They criminalize private people who simply exchange some good works without any thought for profit. The irony here is that artists live and die by renown, and this kind of propaganda and distribution is essential for them. Especially for the lesser-known ones. Restricting this is counter-intuitive. And this is why the laws feel unfair. Similarly, art is culture. Picking up other people’s art and building upon it is central to the development of culture. Copyright law restricts this, and this is also why they feel unfair. And copyright law has moved from a law to ensure that an individual creator can earn money with her work to a weapon in market competition. Not everyone who downloads a work would have bought it. If paying a dollar or not for a song is the only reason for you to download the song illegally, chances are you wouldn’t get it at all if you couldn’t get it illegally. The main advantage of the illegal sources for music was the ease of access. Instead of simply competing with the ease of access, the industry tried to use copyright law to kill the competition so they can sit on their old ways. They’re slowly adapting, but copyright law is not there to protect laziness in adapting to technological progress. In the film industry, there’s even a study showing that peer-to-peer networks do not harm their sales. Except… well, except when the movies are delivered later than where they come out. In a global market, consumers want their products fast. Instead of adapting to that demand, the industry tried to make copyright law more and more strict. And in this effort to abuse copyright law to fight progress, we have seen more and more restrictions to privacy and liberties. This is not what copyright law is meant to do. This is abuse. The same holds true for patents. Patents are meant to reward investment into research. If you spend hundreds of thousands of euros in research, and finally come up with a great idea, you should be able to regain your investment for that idea. If your competition can simply use your results without paying any royalty, you’d think twice about investing in research again. Not punishing research feels fair. Sadly, our patent laws are more used to fight wars over market dominance than to protect research investment. In some cases, new ideas and advances get used only after their respective patents expire. Again, patent laws are used as weapons, and that is simply wrong. It should be mentioned that our patent laws have some added problems. There are a lot of patents for apparently trivial ideas where any kind of property right simply does not feel fair in the first place. Those are ideas where it feels like wasted money if you needed to spend any significant amounts to come up with them (hello, Apple, I’m looking at your slide-to-unlock patent). In all of these cases, the extremes seem clear. Small-scale, non-commercial use of copyright or patented work is fine, and cracking down on that feels wrong. Full-fledged commercial use without permission is certainly not fine. The problem, though, is that there is no clear dividing line between the good and the bad cases. There’s a lot of gray area. Hence the confusion. To solve this, we need to include the concept of “Fair Use” in copyright laws (as the US does), and expand it significantly. First of all, non-commercial use of copyright and patented material is always fine. The advantages of restricting this simply do not outweigh the disadvantages of restrictions in liberties and privacy. Please note, though, that non-commercial use excludes websites with banner ads as well as asking for donations. This restricts the possible abuse greatly. Additionally, building upon and expanding copyrighted work is fine, including for commercial purposes, as long as the new work is sufficiently different. This includes citations, as the created work is the one that utilizes the citation, and hence is quite different. Attribution is always required, though. Finally, using copyrighted works and patented ideas should always be possible under “frand” terms (fair, reasonable, and non-discriminatory). A patent holder should never be able to simply prevent competition based on patent ownership. “Reasonable” here includes that royalties for ideas should reflect the complexity of the idea. And most importantly, copyright and patent law should be based on the goal of making it possible for a rights holder to regain the expenses they had in creating the work, not to provide a tool to fight competition. In particular, lawmakers need to make sure that the rights of others and of society as a whole are not unduly restricted for the goal of regaining invested money.